History of Datong Station and Railroad - Datong did not have its own railway station before the establishment of the Peoples Republic of China in 1949 AD, the development of Datong as the Coal Capital and train shipment center of the country and the construction of the current Station. The Steam Locomotive, a western invention was only introduced in China at the end of the 19Th Century, when they were needed to transport the materials and goods extorted from China by western companies and governments to the coast and China's harbors. 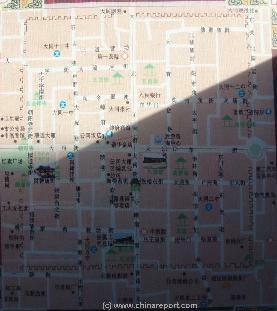 Datong Old Walled City Schematic Map. The Station is located in the North outside this Map. 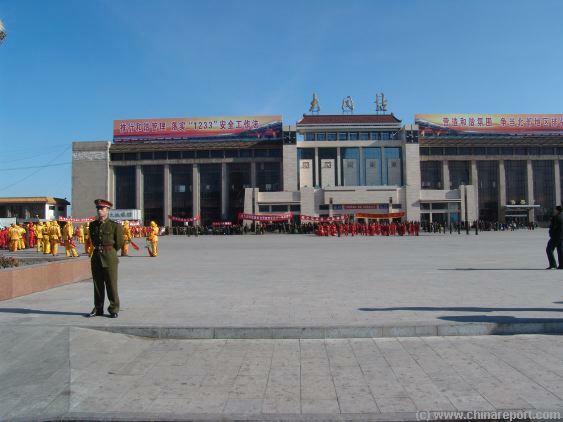 The Front of the main Railway Station of Datong, Shanxi. 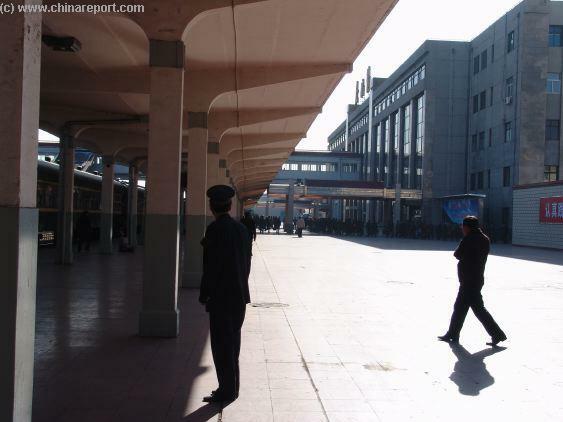 The daytime train from BaoTou, via Hohhot and Datong to Beijing awaits it's departure from the Platform. View of the Platform and Train in both directions <->. Mouse over Image - The Large parade ground like Station Square and the Main Entrance to the Station Building. outside and taking a Taxi Ride to your Hotel. Conveniently, taxi rates in Datong are considerably lower than in the big cities, and when a train arrives at the station, local cabbies gang-up and fight to get the customers. There is always a taxi ready at your service. If not - try CITS or take a hike, literally. 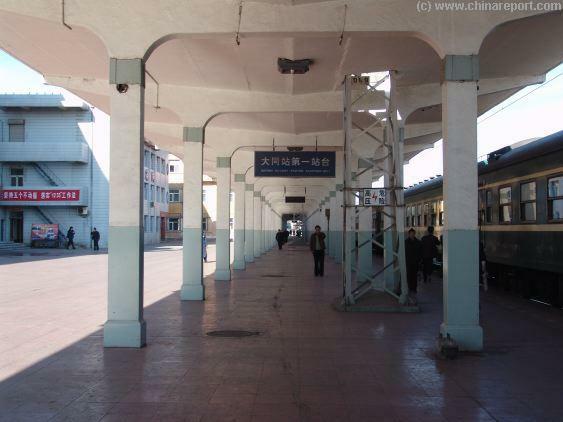 when the City and North Shanxi became the Coal Capital and coal supplier of all factories in the country, the unexpectedly large Station dates from the post'-1949 era. 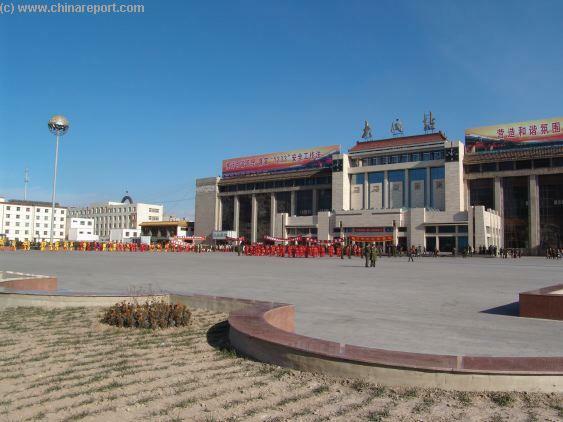 Its main features (as shown) are a a concrete stalinist-like structure, with some chinese features. Province to the Capital of the Province at TaiYuan. 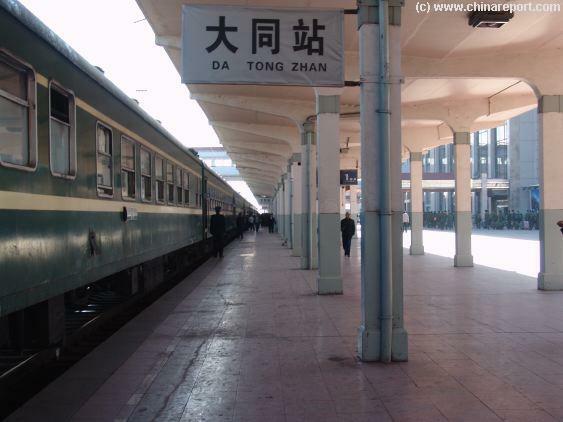 In this way Datong railway station serves the region as a major transportation hub for traffic to the south as well as the inland West, and for a long time it was the only viable long distance travel option in the Province and far beyond. As a cheap and reliable mode of transport with reasonable comfort, even today the station is the life-line of many in the villages and a gateway to some form of Civilization. Hence, villagers and farmers abound onboard trains and regular stops are made at pittoresqe and remote villages to offload some local citizenry, before continuing the long journey West around the Yellow River basin or via TaiYuan, PingYao and Linfen South into Shaanxi Province or Henan. 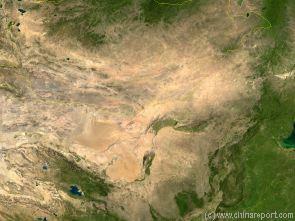 Satellite Image based Map of the Gobi Desert and the Flow of the Yellow River showing Datong and other cities along railway lines near Datong. 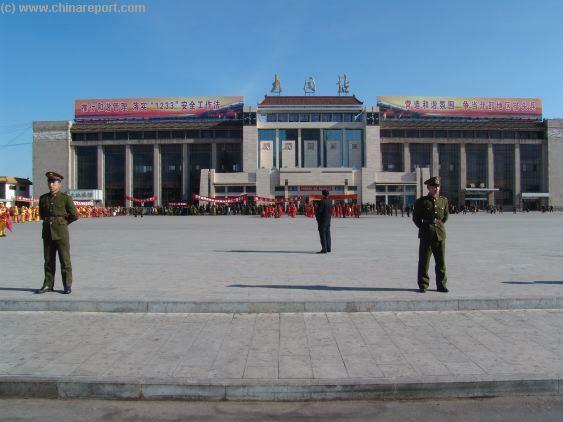 Inside Datong Zhan - the huge size of the Station is emphasized by the figures in the distance. The Train to Beijing leaves from immediatly behind the Main Hall. were a popular mortgage item used to gain access to further lucrative financial deals with the already heavily indebted Ching Dynasty Government. As a result, China was weakened and subdued even further and the western and later Japanese companies layed a network of railways extending from the coast, enabling them to get much needed raw materials to their industries, and conveniently transport their finished commercial products back into China for sale. China. The new track continues from there along a mountain-ridge until it meets up with the Great Wall and travels to Datong. coordination with China's heavy industries during the 1950's and 60's, when as mentioned, North-Shanxi became the Coal supplying region of China. Since the further economic boom that started after China's opening up in 1985, the giant station and surrounding tracks have grown into a huge industrial size complex that can be followed to every major industry in the Area and that is still modernizing and improving today. District of Beijing is the main station for train- connections from Beijing to the West and to the South. Connect West via Hebei Province through to Datong and then on to Inner Mongolia and Ningxia. Or go south to Shijiazhuang in Hebei and beyond.